Michonne is about to have a very bad day. Each week, we comb through the guts of The Walking Dead, much like a horde of hungry walkers, to bring you the episode’s best moments, surprises, and other post-apocalyptic curiosities. This week: scraped knees, spelling bees, and schoolyard bullies. Toughest TWD character: Without a doubt, RJ is this show’s strongest character simply by fact that he was able to survive so much trauma in utero. Think of just how unstoppable he’ll be as an adult. You are the father: We can finally put to bed whether Judith’s biological father was Rick or Shane. With a child so righteous and stubborn, there’s no way that child isn’t 100 percent of Rick. 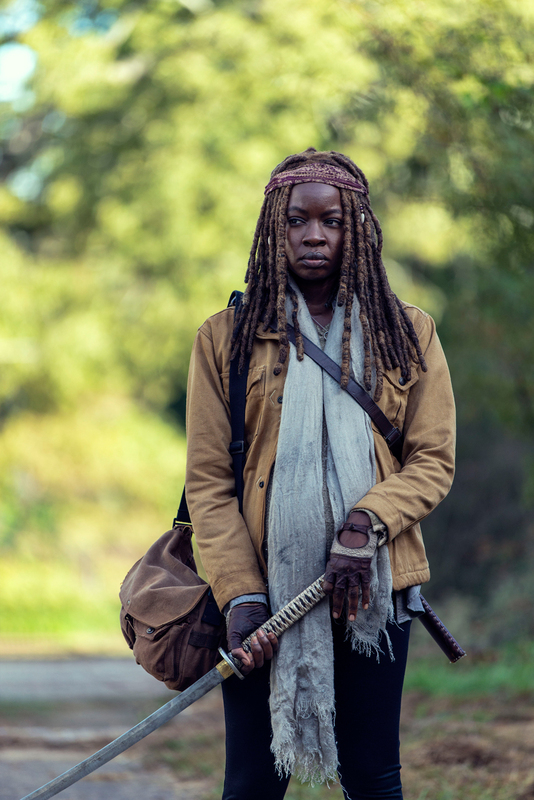 Worst friend: It’s bad enough that Michonne had to endure someone kidnapping her daughter (and every other kid in Alexandria) and then had to kill that person—and several kids in the process—in order to rescue her kid, all while heavily pregnant. But to have that person be one of your best friends from college? Ouch. Curious motive: It’s assumed that Jocelyn’s reasoning for branding Daryl and Michonne was just a way to dehumanize and “harden” the kids, but is it possible the “X” branding is part of some large plot? What happened to all the other adults in her group, anyway? Worst parenting: Jocelyn echoed Alpha when she told Michonne that she had taught her children not to be “soft,” because they couldn’t afford to be in the post-apocalyptic world. Judith Grimes might be the perfect example of why both of them are wrong—a kid can be strong and courageous in this world and still have empathy. It’s not an either/or situation. Biggest revelation: Last week, if you would have told us that Carol would soon no longer hold the title for most kids killed in the series, we’d of called you a liar. Now, well, here we are . . .
Biggest question: How exactly was a handful of kids able to carry off all of Alexandria’s supplies on foot? Second biggest question: What happened to Winnie, the blonde girl from Jocelyn’s camp who ran from Michonne? Did she become a walker snack? A Whisperer? Went to the same mysterious void Heath disappeared into? Most disturbing image: In all honesty, what part of this episode wasn’t disturbing? We’re going to award this one to any scenes involving The Children of Dead. Take your pick from the branding, the fight, or just wandering around the abandoned school. The whole situation is nightmare fuel. Best kill: Michonne’s walled-off nature. Leave it to Judith to convince her that there’s more to life than just protecting your community. Which is why . . .